Hype is often a truly crushing thing. In such a media and communication intensive world it’s virtually impossible for any book, film, artwork, piece of music or game to be viewed in a cultural vacuum, expectations will always shape our impression of things, sometimes for the better, often for the worse. If I hadn’t seen District 9 first. The problem is that the movie’s aesthetics and tone follow on so closely from its directorial predecessor that I think deep down I wanted it to provoke the same shock and awe the latter did. Only how could it? District 9 came from nowhere, a movie with almost no recognisable names attached, set in an offbeat location on the eve of a certain other far more heavily hyped sci-fi movie. I walked into D9 with modest expectations and was completely blown away, but with Blomkamp since praised as an established talent, big-names attached and ‘From the director of-‘ plastered on posters everywhere did Elysium ever really have a chance of meeting my expectations? 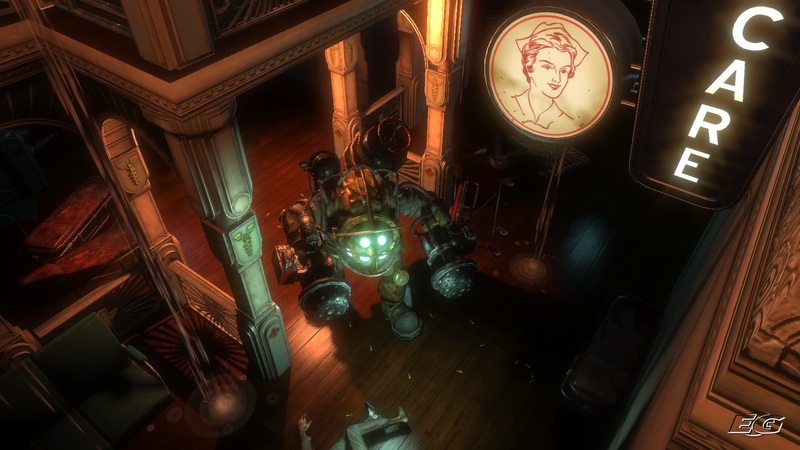 Bioshock 2 – a far more direct videogame sequel – suffered similarly for me. It’s a good game to be sure, with a plethora of mechanical improvements and obvious care poured into its development. Under different circumstances might have been received better, unfortunately it follows a predecessor which literally redefined how I – and likely many others – have come to think of the medium. Developed by a different team, following the path laid down by its precursor with almost religious care it may well have been a doomed endevour from the get go. 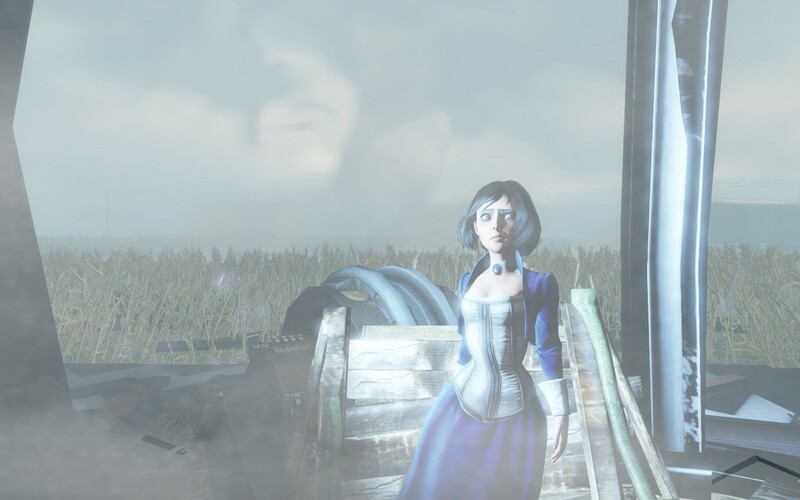 Yesterday I finished Bioshock Infinite, the latest addition to the series. Having been developed by the Irrational Games and my personal hero Ken Levine who worked on the first entry I approached this sort-of sequel with a tempered excitement, wary that given my adoration of Bioshock it would be unlikely to reach those same heights again. I wanted it to be great but I know how often that desire is goes unfulfilled. And oh my it certainly has its problems; there’s plenty of missed opportunities and clunky implementation. However the game’s trump card and defining point of brilliance is that it doesn’t even try to exceed the hype surrounding the series. It incorporates it. It’s only fair to warn you now that there are going to be SPOILERS for the plots of System Shock 2 and the original Bioshock. 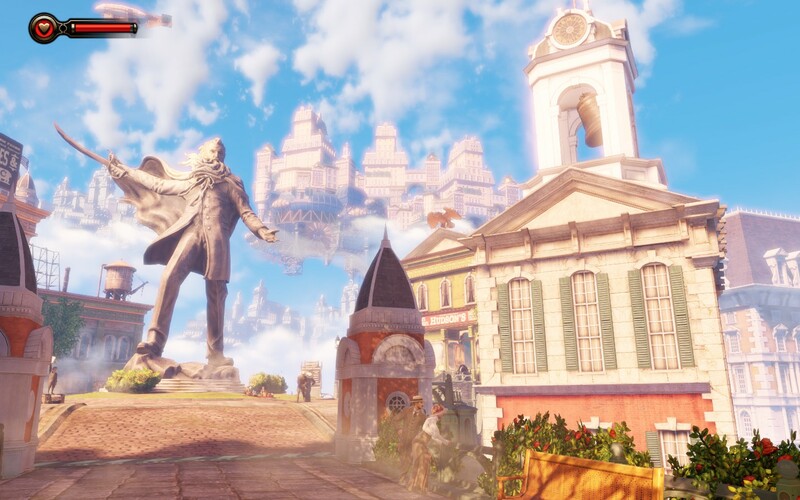 I’ll try to lay off too many specifics in the case of Bioshock Infinite but if you’re still planning on checking it out with all the surprises intact I’d ask that you proceed with caution. 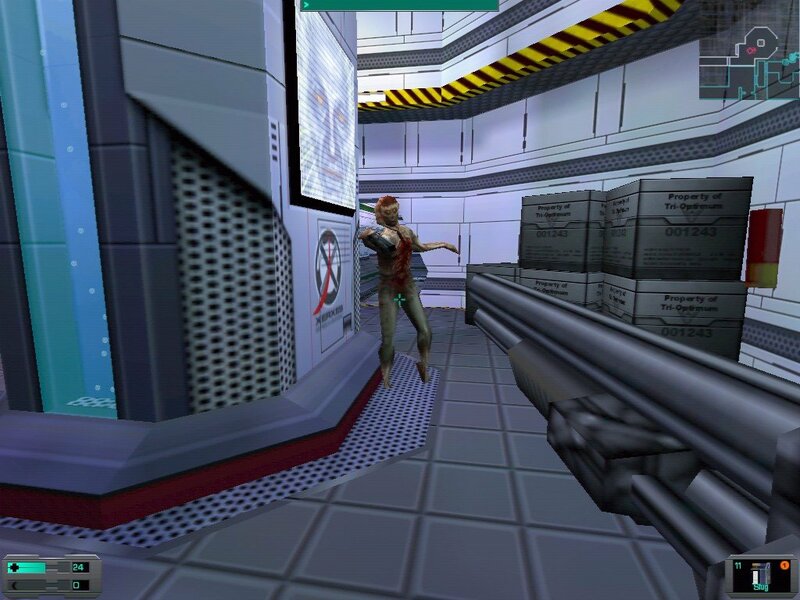 Starting with a bit of history we roll way back to 1999 and the release of System Shock 2, Irrational’s debut project co-developed by series creator Looking Glass Software. This was Ken Levine’s first time taking the lead on writing and design and while it’s not at ‘Bioshock’ game in name it’s where the seeds to its successor are found, forming what I feel is the first entry in a thematic ‘shock’ trilogy. ‘Course I do! You don’t have to spell it out… On a wall… In blood… Ew. The original System Shock was a pioneering effort in 1994 but the sequel refined and polished all its best qualities, stripped away the more muddled elements and brought something new to the table at the same time. It’s a game of legendary status that remains intensely engaging to this day and garnered justifiable excitement (especially from me) when it was digitally re-released early this year. At its core SS2 is a pure survival horror experience; waking up from cryostasis aboard portentously named FTL vessel the Von Braun adrift in deep space, you find the ship almost completely devoid of regular humans, with what company you do have being distinctly mutated and hostile. As such at the behest of e-mails from unsettlingly callous ‘Doctor Janice Polito’ you are required to piece together what happened through scattered audio-logs and set about fixing the situation. While this isn’t an especially original scenario for a videogame to drop you in it’s the details that really make it. The audio-logs establish characters who gradually, disturbingly slip from the day-to-day tedium of their jobs over to paranoia, horror and much worse as things spiral out of control. The gameplay meanwhile quickly takes hold, demanding you to think quickly and watch your back at all times; you never have quite enough ammo, never feel truly safe and are always, always oppressively alone. These hybrids alternate between trying to kill you and begging you to kill them. They’re lovely. The big twist seems pretty unoriginal on paper too, but again the execution really sells it. When you find the long deceased corpse of Doctor Polito your isolation is made complete as you realise who you’ve really been working for and the game’s main villain is revealed. Sci-Fi has no shortage of bonkers computer intelligences but Shodan – also the first game’s malevolent AI nemesis – is effortlessly memorable. Sporting an arrogant ‘goddess’ complex and complete disdain for all lower forms of life, Shodan deceives then forcibly manipulates you to the end of the game, enforcing the feeling of her being a near omnipotent, constant presence alongside the ship’s ominous background hum. Couple that with a voice that will haunt your dreams with rasping, fractured utterances of “L-L-Look at you hacker” and you’ve got the recipe for a perfect nightmare. 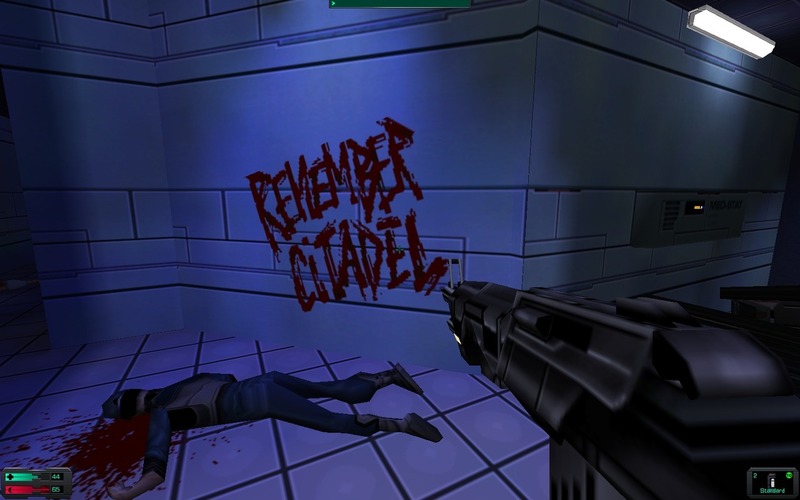 Masterpiece isn’t a word I use lightly, but System Shock 2 is just that. The low number of polygons and fuzzy textures might be betray its age but as far as playability and atmosphere goes it’s still a stunner, essential to anyone who loves the sci-fi/horror genre. As such 2007’s Bioshock had a tall order to meet following this. It’s not a direct sequel – some rights complications put a stop to that – but the overall template and presence of Ken Levine on writing duties again make this feel very much like a continuation. That said, when I initially began playing it I was concerned it was more of a remake; a friend of mine said he was “envious” of people who went straight to playing Bioshock without playing SS2 first and I get what he means. Putting aside the very different era, setting and aesthetic the base elements are nearly identical. Picking up audio logs depicting the decline of civilised values over to animalistic bio-horror? You got it. A silent protagonist with no back-story dropped in to fix things? Of course. Near constant solitude and danger? Naturally. There’s even a big twist in the final act where your guide over the radio turns out to be the main villain, sound familiar? To anyone who’s played System Shock 2 it’s basically business as usual with an art deco twist. 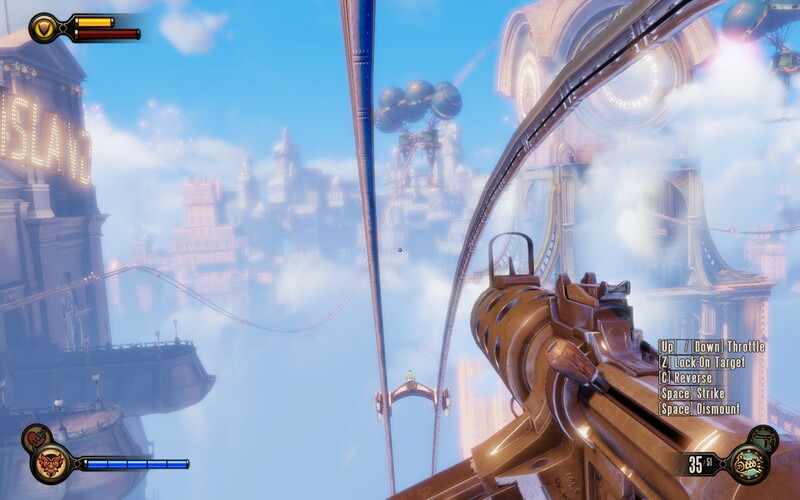 Bioshock’s trick is in extensive layering and depth of the setting, coupled with a willingness to play with subtlety which is lost between explosions in most other FPS. I’m not going to try and claim that ‘Rapture’ – the game’s city beneath the sea – is scientifically plausible, but the politics and noble intentions on which this aquatic ‘utopia’ is founded all feel very credible. Mixing believable historical details of the post-WW2 period with more fantastical sci-fi elements a truly immersive world is created, far richer and more unique than System Shock’s steel corridors, space mutants and insane AI’s. It lacks the moment-by-moment tension of the latter and the controls feel a tad gluey, but it makes for a distinct and boldly different follow-up. Comfortably familiar but also exciting and fresh. ‘Care’. What you’re going to need after running into this guy. The writing ups the ante as well. The surface story itself is harrowing enough, with Rapture’s founder Andrew Ryan building his city on the seemingly noble intention of ‘free-enterprise’. Throughout, there’s a palpable sense of rising dread as you piece together the decline of the city’s inhabitants; whether through the genetic manipulation and powers of ‘Adam’ – Rapture’s driving discovery – or an inexorable moral decline away from surface control, almost every character’s story you trace takes a chilling trajectory into the heart of darkness. 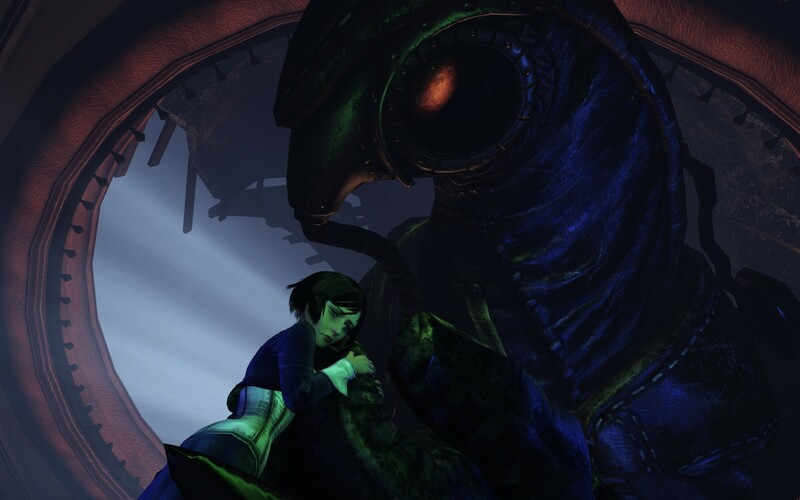 Where Bioshock really sets itself apart from the crowd though and what the story is really about has nothing to do with the politics at work, at its core this is a game about games. The shameless trick is in leading the player to believe their character is basically a nobody, a speechless Mr. X or Deus ex Machina with no connection to the world they’re in, only the objective to ‘fix it’. It was that way in SS2 and pretty much every other shooter, so why would it be any different here? Even more astounding is the way clues are dropped under your nose from start to finish. Again your being manipulated, however this time there was never any question of choice; speed grown and genetically programmed to obey the phrase “would you kindly” you’re casually led along and told what to do with the words innocuously inserted before each order given. “Hang on” the player thinks, “that’s not true, I was always in control…” But were you? Are you really in control in any games? No matter how much ‘freedom’ a game might claim to have there will always be rules, always be constraints instilled by the developer and almost certainly objectives you will need to follow to progress. 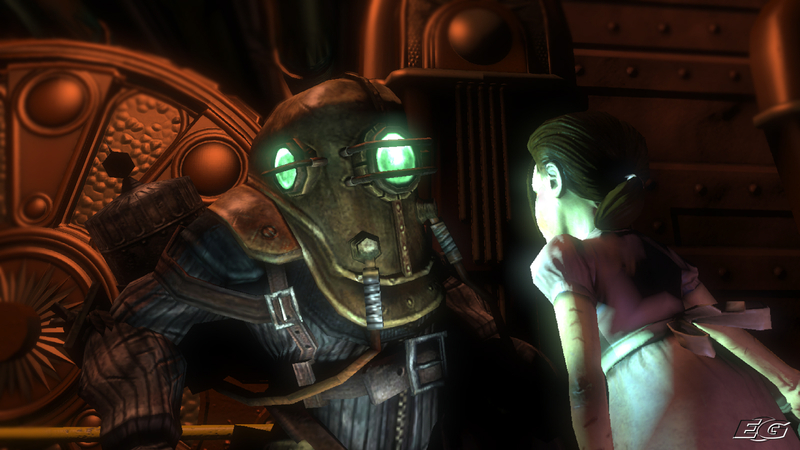 Bioshock doesn’t give you any more freedom than it’s contemporaries but it provides a powerful critique of the medium, reminding us that most of our choice remains an illusion. Good job I’m not terrified of rollercoasters! Oh. wait. 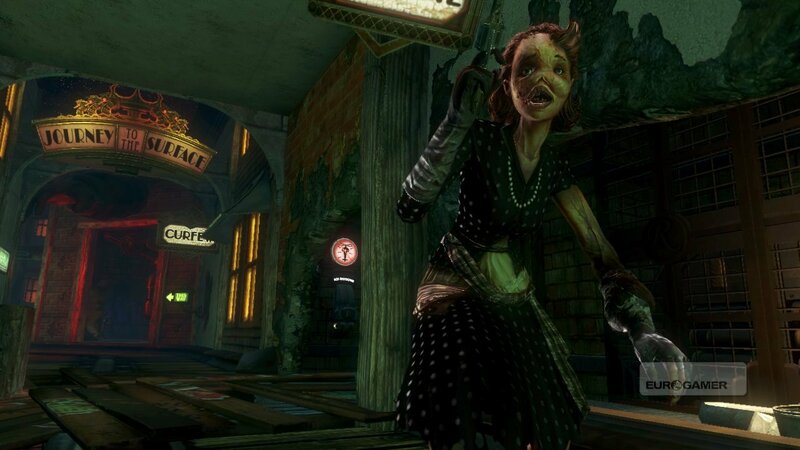 Much as I’d like to ignore it completely for its unadventurous continuation of the universe, Bioshock 2 may have well played a key role in shaping the third entry in Irrational’s trilogy. The fact the series had already had one disappointing sequel from a different developer most likely gave Levine and his team an idea of the expectations they were dealing with for the next major instalment. It’s to their credit that rather than ducking under this problem or pushing against it ineffectually they make it an integral part of the narrative and even the gameplay itself. Things are mixed up quite a bit from the start; this time we find ourselves in an ultra-nationalistic flying ‘utopia’ Columbia around 1912, our character Booker DeWitt has a voice and back-story while rather than exploring the ruins of a society you are thrust into the middle of living and largely functional one. Still there’s an unshakable familiarity to proceedings at first. The hallmarks from former ‘Shock’ games are firmly in place from super-powers (‘Vigors’ here) to audio logs. It’s all invested with absolutely stunning detail and there are moments of unmatched exhilaration but for the first few hours of the game I couldn’t shake the sense that something was really off. My mistake was in thinking this all occurs by accident and not by design. The first major shift takes place when Booker meets and rescues his objective – a girl named Elizabeth – from imprisonment by the Columbia’s puritanical founder Father Comstock. It’s quickly established that Elizabeth – the games other major character – has a unique power to create ‘tears’ between dimensions, an ability which initially is utilised in gameplay before developing into something much, much bigger. I’ve heard people say this ability is inherently ‘out of context’ and indeed I can’t believe it’s coincidental in relation to the other out of place elements. All the little nods to the previous ‘Shock’ games are deliberately misleading, giving you the impression you’ll be getting more of the same then slapping you in the face at the last minute. 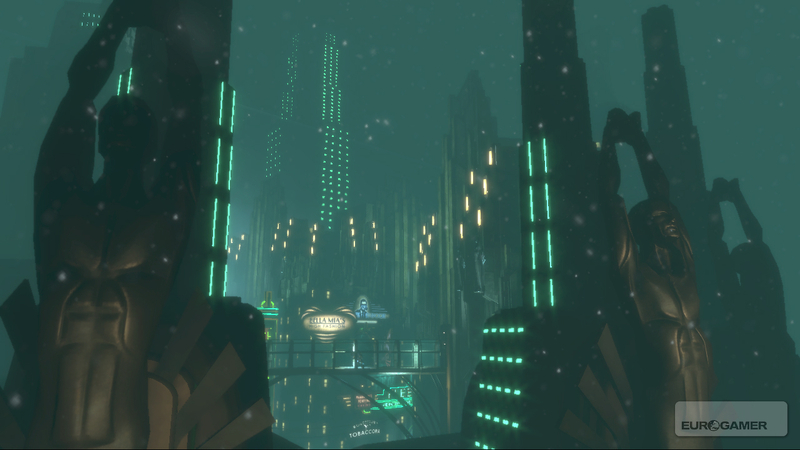 It’s indicated that the world itself is built on stolen pieces from other realities; music taken from the future and recomposed in era style, advanced technologies borrowed, while in a neat touch even the vigors are hinted at being based off a glimpse into the world of Rapture from the first Bioshock. It feels like a bit of a mishmash of concepts because it’s actually meant to. I won’t go into the intricate details of the exact plot, as while brilliant it would require another article’s worth of writing to break down and is frankly best experienced firsthand. What I did want to cover here is what the game really seems to be saying and how it addresses the burden of expectation. How on earth do you make a sequel to something tearing open the lid on the illusion of choice? Well, if Bioshock was essentially a game about games then Infinite is a game about the Bioshock series itself, the unavoidable hype surrounding it and franchise constraints. As the story progressed the use of Elizabeth’s tears becomes more extreme and it’s not long before you’re hopping between realities, each time the implications and changes becoming more drastic. Regardless, it seems as though a sense of fate is being hammered in, with nothing really being changed for the better in the long run. In an early scene involving the Lutece’s – a pair of scientists who keep appearing everywhere with supernatural regularity – they ask you to flip a coin and guess which side it comes up. Guessing heads it comes up as such and they mark it on a board of constant heads with weary knowingness. Someone had to point it out to me but this is something repeated every time you’re thrown a coin in the game, it always comes up heads without fail. This is essentially the grand joke on the player; no matter the route taken the end results are the same. As such when the inter-dimensional meddling final pulls the game’s world apart in the final act it is with a satisfying resonance that Elizabeth notes “we swim in different oceans, but land on the same shore” and that “There’s always a lighthouse, there’s always a man, and there’s always a city.” The real strength of this line is that it not only refers to inevitable conclusion awaiting Booker at the end of story but that it refers to the Bioshock series as a whole and systematically deconstructs the principles it’s built on or as they put it the “constants”. The series has always fascinatingly adhered to these constants while straining against them wanting to be more; to push the medium’s boundaries while all the while being tethered to the expectations of its audience. It’s a sound thematic conclusion not just to Infinite but all its forbearers. Each game has taken a different route but each ends up on the same shore, the honesty with which it acknowledges this being completely disarming and almost completely unheard of elsewhere in the industry. I could write more than a few essays on all the thoughts and feelings the Shock trilogy has inspired in me, but in simple terms perhaps the reason they’re so important, so personal to me is the sense we’ve grown up alongside one another. When I fired up Doom back during my carefree childhood it didn’t matter there was no real story or deeper reason to shoot monsters in the face, just as I might have innocently and un-ironically enjoyed Rambo: First Blood Part II before I learned what propaganda was. With each blast-by-numbers shooter I play though or RPG where you’re the heroic world saviour I feel increasingly disenchanted by the formula. Just as I’ve increasingly questioned the strength of interactive stories, justification for simulated violence and artistic merit of games as I age, so too it seems has Irrational. Their games aren’t offering the answer necessarily, but they do take a moment to stop and make us question what we’re doing and why. I can’t lie, I still love shooting virtual monsters/thugs/robots in the face sometimes. That said I’m very glad games are made which can still shock us out of the familiar pattern and remind us that there’s always more. This entry was posted on Saturday, October 5th, 2013 at 8:49 PM and is filed under Miscellaneous. You can follow any responses to this entry through the RSS 2.0 feed. You can leave a response, or trackback from your own site.